Robertson County vital records are available from the County Clerk's office (http://www.co.robertson.tx.us/ips/cms/countyoffices/countyClerk.html). The county clerk files and records birth and death certificates and issues marriage licenses. 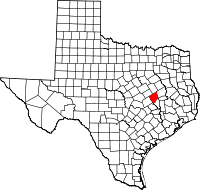 The office serves the cities/towns of Astin, Bremond, Calvert, Franklin, Hammond, Hearne, Mumford, New Baden, Petteway, Ridge, Tidwell Prairie, and Wheelock. Inquiries may be made by phone at (979) 828-4130. Vital records are available to qualified applicants and with proper identification for a fee. Fees for copies of records vary according to the documents required. Certified copies of divorce decrees in Texas are available only from the district clerk in the district in which it was obtained (see http://www.dshs.state.tx.us/vs/field/localremotedistrict.shtm#district). Note: Fax number is 979-828-1260. It goes through several rings before answering, should call first.